Earthquake Prediction: CANADA: CO in Williams Lake Fires? CANADA: CO in Williams Lake Fires? Carbon monoxide levels well over 10,000 ppb shown at the map above in Canada at 60N, 109W. 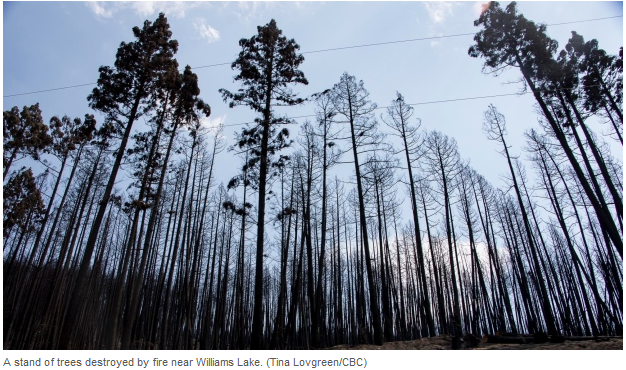 Just two weeks after residents forced out by wildfires were allowed to return home to Williams Lake, several people have been arrested for allegedly trying to start new fires in the B.C. city. Five male suspects were taken into custody Tuesday after a number of attempts were made to set fires in the Lexington Road Subdivision, according to an RCMP press release. One fire was extinguished with the help of quick-thinking bystanders before any damage was done to nearby homes, police said. "The immediate response of the bystanders and Williams Lake Fire Department likely prevented this event from causing serious harm to the homeowner," RCMP Insp. Jeff Pelley said in a press release. "Another fire within the city limits could have had a detrimental effect on our community." A number of homes in the neighbourhood had also been broken into, and witnesses reported seeing people hiding nearby as they tried to light the fires.